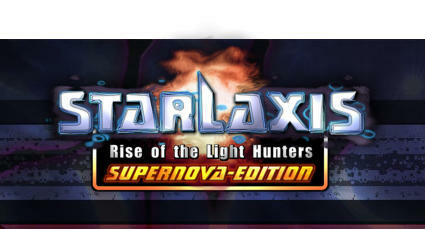 In Starlaxis you are completing missions to continue the story and unlocking new levels. 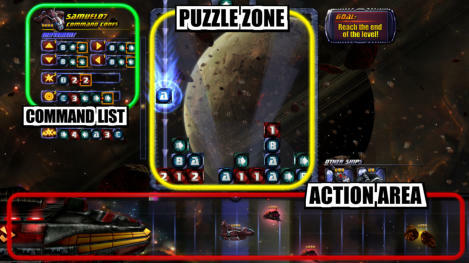 There 2 different game fields which influence each other: The PUZZLE ZONE and the ACTION AREA. In the ACTION AREA you’ll see your spaceship which can be controlled through actions in the PUZZLE ZONE. If you want to finish a level succesfully you have to fullfill a special goal, for example defeating all enemies or protecting other ships. In the PUZZLE ZONE you can move and turn cubes in order to build command codes to move your spaceship. In the COMMAND LIST you’ll find all commands which you can use for your current ship. 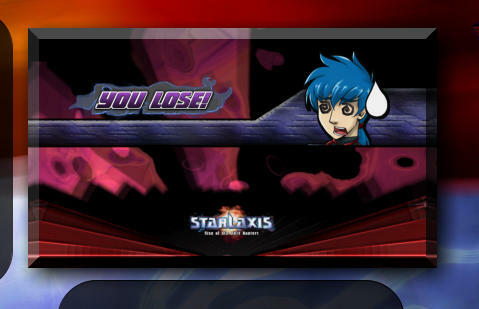 For example, if you want to move your ship forward, you have to line up a “B” and a right pointing arrow! If the cubes pile up to the opening, you lose! To prevent this, you must remove them. Line up three or more cubes with the same symbol and they'll disappear! They also disappear when you’re building commands.